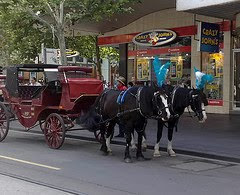 It's the race that stops the nation and keeps Melbourne's milliners in business. 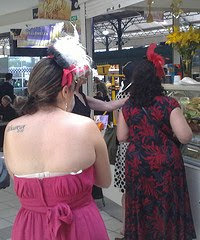 Living not far from the track means that I've seen heaps of feathered finery so this Melbourne Cup I snapped a couple of fascinators while escaping the throng. Made from feathers, flowers or fur and later on in the day bits of bread, beer caps and raceday flotsam, the fascinator is best seen in the morning. By the end of the day they're teetering on the edge like the drunk on high heels who is probably supporting this elaborate construction. The wave of style washes in early as punters are keen to find their place in the carpark and flush away a few bets on dead certs. Somewhere in the balancing of headgear (when does a fascinator become a hat?) there's a horse race, but mostly it's about drinking. After a long day of waiting to not be invited into a celebrity tent, most stagger home or shout at cab drivers. Some take time out to vomit in local resident's letterboxes so we can all share the excitement of the big day. It's quite a feat to keep your headgear when all inside you is let loose. are those girls all wearing the same hat? fancy. Yes, last Saturday morning as I left the gym, I saw a woman with a black la crosse stick. 'Fancy that,' I mused 'it's not every day you see a la crosse stick. Then the woman emerged from behind her car- only to reveal it was stuck to her head. @genevieve, yep, lots of same hat going on. Seems to be a way of bonding. @zerafina, lacrosse stick is a new innovation. Hope it leads to whole football fields being mounted on heads for next season. 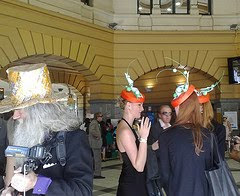 the hats you are wearing are awesome!! !